First of all I want to thank my Higher Power for allowing me to see the other side of my addiction. The side that I used to think was not meant for me to live. I used to dream of a life without the use of drugs but never thought that I could have that life. It wasn’t in the cards, I wasn’t good enough to live the life that I saw so many others living. I believed those lies to be true. My destiny was to die an addict. I truly believed that. No matter how hard I tried, I just couldn’t stop using. So I gave up. I quit trying, I lost all hope and settled for a miserable existence of a life. I became comfortable living life finding ways and means to get more. More pain, more misery and more suffering. I was blessed to be able to see not just another day, but several years. I remember being at the end of my rope. I remember wanting to die and just get it over with. I prayed for death because in my mind it had to be better than the life I was living. I didn’t know then, what I know now. There is a way out. I am still amazed at times how my life is turning out. I can’t believe how fortunate I have been and how many blessings I have received since getting clean. My life has been nothing short of a miracle. I live, love and laugh today and for that alone I am truly grateful. I have so many good people in my life who support and encourage me to be the best I can be. They help me to realize that the only thing that can stop me from realizing my dreams is me. I have blocked more of my own blessings than the Carolina Panthers have blocked opposing teams. Lol. (Taking a shot there). The last couple of years have been truly amazing. I have been doing everything that I always told myself that I could not do, only to find out that I can do it. I am excited to announce that I have finally been able to make one of my dreams come true. 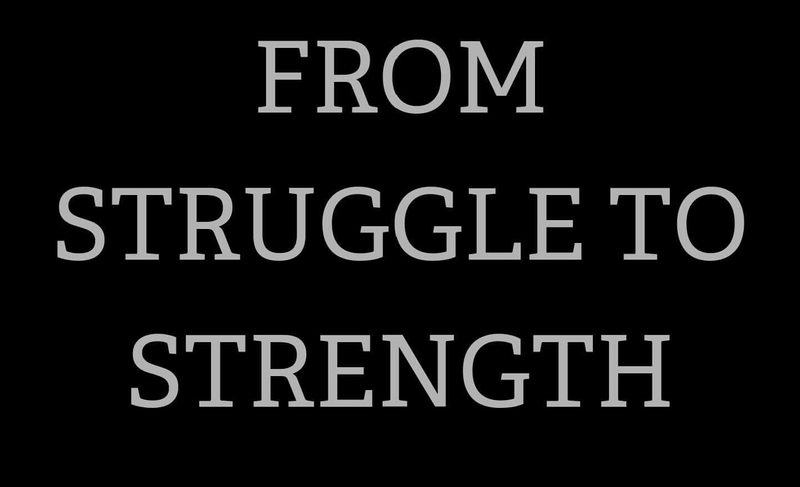 I have started selling From Struggle To Strength Tee-shirts a few years ago mostly to friends and family. Today I have taken the steps to take my business to the next level. I have opened up my own online store. I am officially an entrepreneur. I have been dreaming of owning my own business for quite some time and this is the opening I have been looking for. I am looking forward to one day being able to quit working for others as my business gains traction. I want to thank everyone who encouraged me to take the risk. Fear kept me doing it on a small scale. Overcoming that fear has allowed me to visualize bigger and better things in the future. I am thankful for the opportunity to share with you all my journey. Just as others have shared theirs with me. I hope that you are will share in my joy. Please feel free to stop by and check out the new site. I wish you and your family a very Happy, healthy and safe Thanksgiving weekend. I can remember in my active addiction the lies and deceit that I have perpetrated. I can also remember those times that I was telling the truth and had wished that people would believe me. I remember the looks I used to get at work and everywhere else I went. The stares of disgust and the disapproving glares. I remember the hurt I felt. The shame and the abandonment.The embarrassment alone was enough to make me want to run. I used for years of that alone. It wasn’t that long ago and the scars are still there. Some are fresh and others have long been absorbed, locked and stored away deep in my sub-conscience mind. Only to be awakened when a similar circumstance arises. I always said that I would never judge another person solely on the fact that they had a problem with substance abuse. I always thought that I would be the first to have empathy when it comes to the still sick and suffering addicts. I truly believed that I could never look down on another person just because they were using. Being a recovering addict, I should be the last person to act like people did towards me. I have come to realize in a current situation that, that is not the case. I was in denial about it and after taking a self inventory of a situation that is playing out on my job right now. I find myself being very judgmental of a coworker. I find that I have not been showing care and concern towards this individual but instead I have been distancing myself and displaying those same looks of disgust and glares of disapproval. I am guilty of doing the exact same thing that people did to me when I was using. I am ashamed of the way that I have acted towards this person the last couple of weeks. I have not been showing care and concern, I have not been living by the creed of one addict helping another. I have been cold and uncaring. I have been acting as if I do not know exactly where he is at, knowing damn well that I do. I have been in his shoes for years. I was not going to share this behavior because I was ashamed to admit it. I was more concerned with how people would view me if I admitted the truth. I always share my truth and that will never change, but I always try to share the good things, the good times. I have a hard time sometimes admitting that I am capable of making mistakes. That I am not perfect. Although I know that I am not nor would I want to be perfect. I still suffer from ego and image. I still worry about how people view me and want everyone to like me. I still suffer from low self-esteem. I have flaws and defects that I need to focus and work on. I am a work in progress not a finished product.The truth is I am not perfect. I am still capable of making very bad decisions and acting off impulse. I am guilty of jumping on the band wagon. Everyone talks about this guy on the job and I find myself right along with them. Instead of being right there with him and letting him know that everything is going to be alright. Offering him a helping hand and showing him that there is a way out. I know better and it is my responsibility to share the escape route with others. To let them know that there is freedom from active addiction. But I chose to ignore my responsibility, to save face and hide my addiction. Oh course I have a responsibility to myself as well. Anonymity is very important but not at the expense of others. I can still help him and remain anonymous. So that is not a rational justification. That’s the addict in me trying to let myself off the hook. I am grateful that I can see the error of my ways today and more importantly I can change them. I can and will take a long hard look at why I feel so comfortable judging someone that I have more in common with than not. Why I feel it’s ok to judge someone period. Have I been rocking myself right to sleep because I am living a life that I could only dream of a couple of years ago? Have I forgotten the hell that I have just came from? Or do I think I am better than now that I am not using? These are all questions that I will be looking at on a deeper level. I need to get back to the basics and plug myself back in. Rework my foundation and inventory my attitudes and behaviors. It’s time to check myself before I wreck myself. I am far from better than anyone just because I no longer use. If I forget where I came from, I will be doomed to repeat.